We want to offer a high-energy entertainment that captivates audiences with a dynamic display of traditional and modern Japanese taiko drums. We offer a broad range of live musical performances, which can all effectively synergise with the tone and theme of your event. Perfect for everything from public to private parties, in France or abroad, we can perform as a duo or with other musicians. We play our own compositions, our musical repertoire reflects our attachment to Japanese tradition and our desire to open to original contemporary creations. We can also specifically compose to match the theme and atmosphere of your special event. Do not hesitate to contact us for any question, we can accommodate space and budget for every special event. 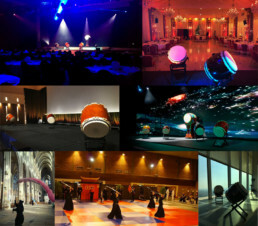 Extract from a rehearsal of NIKA TAIKO in Paris. The show “IKIGAI” created in 2018 displays a powerful and positive energy, mixing traditional Japanese rhythms and original contemporary creations.